Galashiels Rotary Club is again supporting Gala in Bloom this year and Rotarian John Gray handed over a �250 cheque to Judith Cleghorn, of Gala in Bloom, at the latest community council meeting. Galashiels Rotary Club is again supporting Gala in Bloom this year and Rotarian John Gray handed over a £250 cheque to Judith Cleghorn, of Gala in Bloom, at the latest community council meeting. 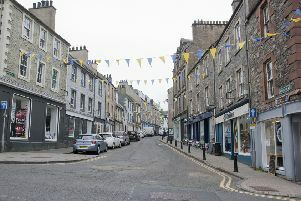 The money will mostly be used to plant the beds outside Gala Aisle, providing a colourful entrance to the town. As well as the cash, Rotarians help with the maintenance of the Old Gala House gardens and are organising a clean-up later this month. They were also involved in clearing the Market Street entrance to the Tesco supermarket recently.